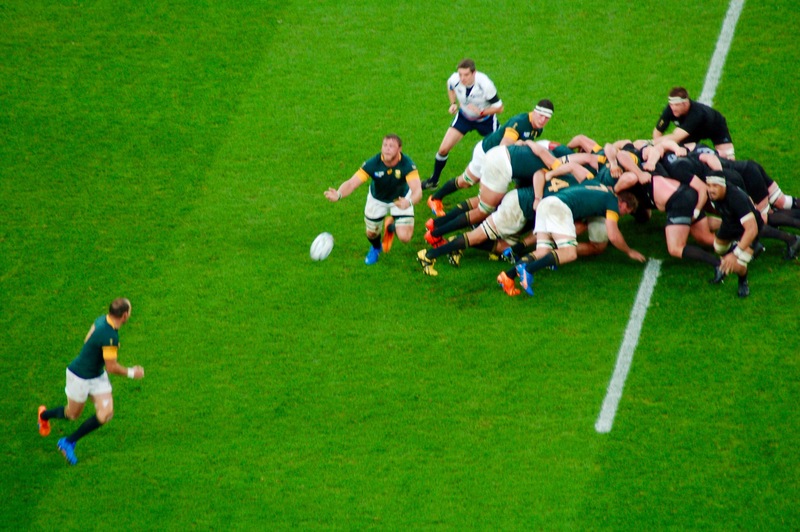 South Africa has good ball out from their scrum. Early in this Rugby World Cup 2015, New Zealand blemished their wins with mishandles, some penalties and a very few missed tackles. But it hardly mattered as the All-Blacks swept away the competition in Pool C and then destroyed France in their quarterfinal game, 62-13. But it matters today, especially the penalties: four of them that resulted in kicks by South Africa’s Handre Pollard to take a 12-7 lead. The game has been a choppy sort of affair, not the smooth running dominance the All Blacks have shown in previous games — when they weren’t mishandling. Today’s game has been interrupted by NZ miscues, most of them at the loose play although they have also been guilty of collapsing a scrum. The penalty with the most potential for damage came within two minutes of halftime when Jerome Kaino, trying to get on sides at a loose scrum played the ball from an offsides position. The referee ruled it a deliberate kick and served Kaino with a yellow card. The All Blacks will be without him for about eight minutes in the second half. He scored the only try in the game, converted by Dan Carter for New Zealnd’s 7seven points. Posted on October 24, 2015 October 24, 2015 by jbsaulPosted in RugbyTagged All Blacks, New Zealand, Rugby World Cup, RWC, South Africa, Springboks.